JLupin Microservice is an independent application (from development and deployment perspective) running its own process, configured and managed by Main Server. application - a computer program written in JAVA (or any other language that based on JVM and uses JVM as a runtime environment), run by Main Server as separated JVM process. This approach ensures separation, resilience and responsiveness of the applications. technical - a separate process managed by Main Server, it extends the functionality of the JLupin Platform. 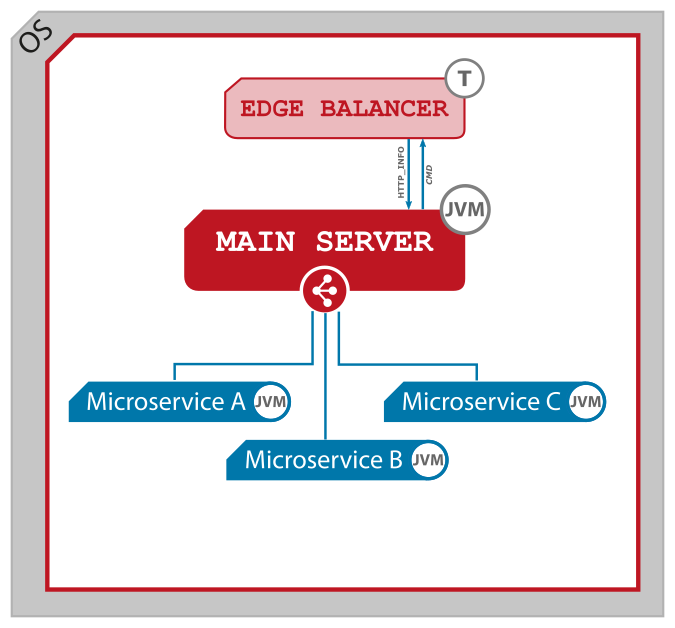 Currently, we distinguish one technical microservice - JLupin Edge Balancer, which supports the process of providing microservice services and allows the implementation of a fully uninterrupted restart at the edge of the system (in 'access' layer). Would you like to know more ? Go to this chapter, please (coming soon). servlet - this type of microservice is a embedded SpringBoot implementation and provides full support for Java servlets. This type is suitable for access / presentation layers, where pure HTTP(S) access is needed. native - native JLupin Platform microservice - a set of POJOs configured by Spring IOC container. This type implements all platform's features and is suitable for middleware layer / business logic functions. In this documentation, in each case where we use the "microservice" word we mean application microservice. In case of any topic related to technical microservice we will use the phrase "technical microservice" explicitly.